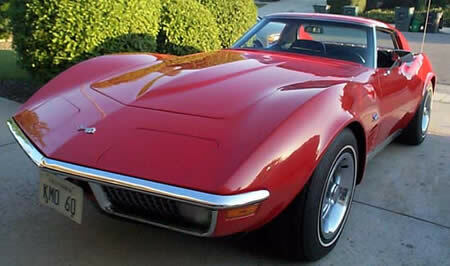 The 1970 C3 Corvette saw a slight body style change. Fender flares were added to reduce damge casued from wheel-thrown debris. Also changed was the side louvers from the 1969 Shark gill looking vertical slats to the egg-crate style to match the front grill. 1970 will be the last year that high compression engines are available due to lower octane unleaded gas. See below for production numbers and 1970 Corvette specifications. New LT1 engine with solid lifters and 370 hp offered. Fender flares added to reduce damage from wheel-thrown debris. Eggcrate pattern in grille and side louvers. New interior design with deluxe option offered. 1970 production did not begin until January 1970 due to extended 1969 production. 1970 Convertible - Asking price: $39900 - California Car!